Shrub rose with prickly arching stems. Pinnate leaves of up to 15 leaflets. 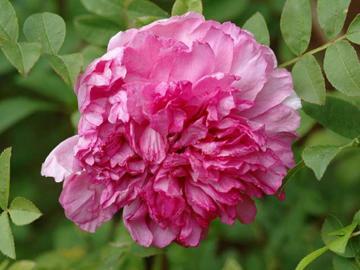 Fragrant double or semi-double reddish pink flowers up to 6cm across. Repeat flowers from early summer. The fruits are covered with spines, resembling a chestnut. Shrub borders, informal hedges or can be trained as a wall shrub. The hips are edible and are very rich in vitamins. The hips and roots are also use medicinally. Native to China, found in mountain forests and thickets.